Birding Is Fun! : Birds to see in Ohio: How did I do? 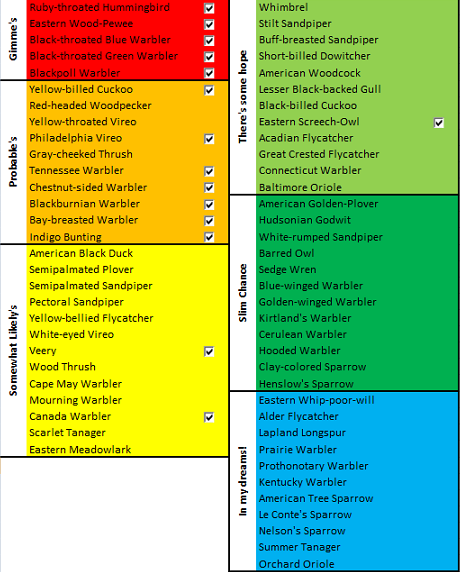 In my preparations for the Midwest Birding Symposium, I used eBird to create a chart of potential life birds, which I organized by my likelihood of seeing them. Then I used a systematic approach to studying the fall plumage of eastern warblers. Well, how did I do? and how effective was eBird (meaning all of you wonderful eBirders out there contributing your sightings data) in revealing the true probability of finding these species. As you can see, I was able to add 15 life birds, which was fantastic! I got all of the "Gimme's", but not without some effort and luck. I had almost given up on that Ruby-throated Hummingbird after a day and a half. Though there were several feeders up at homes and at the birding locations, I never saw a hummer at a feeder. Finally, at Meadowbrook Marsh, we had a couple buzzing around and landing in the trees and bushes in which we were seeing all of the warblers. Very cool! I was glad to see them "in the wild" anyway. I only saw one Eastern Wood-Pewee, so I'm grateful for the luck of seeing it. We did see dozens of Blackpoll Warblers, but only a few Black-throated Blue and just a couple Black-throated Greens. My prior warbler study proved very useful as I "recognized" many species instantly. With the help of the great birders I was with in the field, I was able to learn how to "identify" the other species. Of the "Probable's", I did get most of them. I never was in Red-headed Woodpecker habitat. Looking in eBird, it looks like no body reported Yellow-throated Vireo during the Midwest Birding Symposium. I guess I just missed Gray-cheeked Thrush as I see from other bloggers that one was banded at the Black Swamp Bird Observatory. Darn! Of the "Somewhat Probable's" I was grateful to see the gorgeous Canada Warbler and I was able to hear, but not see, the Veery. I saw a photo that the BSBO also banded a Veery during the symposium. Scarlet Tanagers were seen by a few people, but I dipped. Oh, well. All the more reason for a return visit, right?! Eastern Screech-Owl turned out to be much easier than being on the "There's some hope" list. Anyone would miss them I guess, unless they went out at night to hear them. Greg Miller had heard a Barred Owl from the parking lot of Meadowbrook Marsh one early morning, but Donald the Birder and I couldn't track one down Saturday night. I never made it out to do any shore-birding, though I understand an American Golden Plover and White-rumped Sandpiper were seen at Ottawa on the auto tour. Looking back at my method of creating the probability chart I recognize a couple mistakes I made. First, when I pulled eBird sightings data, I didn't focus on just Ottawa County, but pulled data for all of the surrounding counties too. Now having been to the area, I realize that the counties along the shore of Lake Erie have a very distinct habitat than the counties a bit more inland. Second, I was so enthralled by the pretty warblers that I never made it out to do any shore-birding, which could have added several more life birds. The probability chart worked accurately enough. Though one thing I did notice in eBird was that most of the data was from sightings by just a small handful of folks during the 2009 Midwest Birding Symposium. What that tells me is that we need more eBirders in that region and more eBirders at the symposium. I thought with the BSBO people there and regular visitors, that at least a few would be diligent eBirders. I guess they are too busy collecting their own data and that eBird would just be a lot of time for data entry duplication. So the moral of his post is that eBird data and study is very helpful when preparing to go birding in a location new to you. Birds are birds, and weather is weather. Birds and weather don't follow our calendar perfectly. So now matter how systematically I tried to prepare, birding will always be an exciting game of chance! @Chris - Three lifers in Iceland sounds pretty great! I'd love see your Icelandic birds. @Corey - I regret not going out there earlier on Thursday and staying a day longer to go birding with you and maybe get some more of those birds. Man, I had a great time though! Robert, I am so glad you eBird! As you can see, so many birders out there don't and eBird needs that data! I ran into the same thing with my birding friends in Tucson. Though they were part of Tucson Audubon, they did not see the need or feel they had the time to input data to eBird. Though, I can tell you from experience that eBird data input is much faster than the cumbersome method they use for the IBA survey there. While all of them kept records for their own life lists and love helping out Audubon, they do not yet see the need to add to eBird. It's too bad as many of them have extensive Life Lists from all over the world! anyways, good for you and keep it up (as I know you will.) eBird and I both appreciate it. I so believe in what eBird is doing and for me, eBirding makes what would normally be just a hobby feel meaningful and worthwhile.